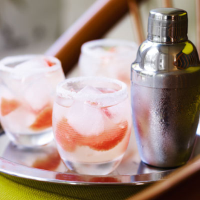 A fresh take on the classic combination of grapefruit and vodka. Rub the grapefruit around the outside edge of a tumbler and roll the edge of the glass in sugar. Muddle the grapefruit with half a teaspoon of sugar in the bottom of a shaker. Add vodka, Cointreau or triple sec, and ice. Shake well. Pour drink, including ice and grapefruit, into the glass.